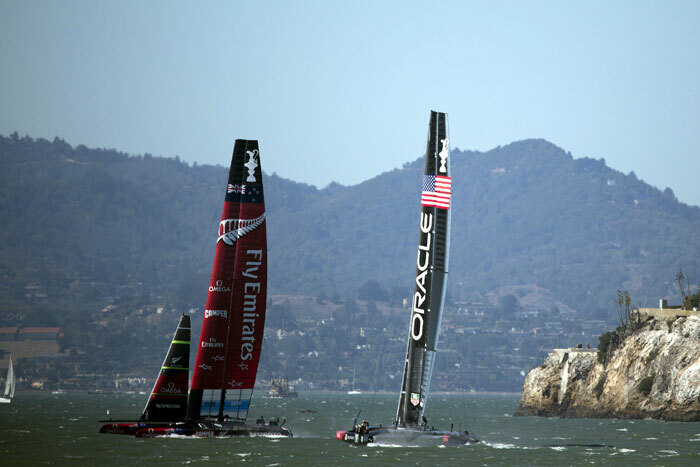 SAN FRANCISCO (LOG NEWS SERVICE) — America’s Cup Races 11 and 12, originally scheduled for Sept. 17, were postponed because a combination of strong winds and an outgoing tide exceeded the limits for racing. The races are rescheduled for Wednesday, Sept. 18 at 1:15 and 2:15 p.m., and race officials said that the winds are expected to be much more favorable. Racing is scheduled to continue Thursday, Sept. 19 and throughout the rest of the week, if needed. Emirates Team New Zealand is leading on the scoreboard 7-1 and only needs to win two more races to take the America’s Cup home to New Zealand. Oracle Team USA has won only three races and needs eight more race victories to retain the America’s Cup, because of a two point penalty.